Boooyyyy do I love me some Mexican food! Right next to Italian food, it has a special little place in my heart. But it has to be authentic Mexican food. Not that Tex-Mex stuff. 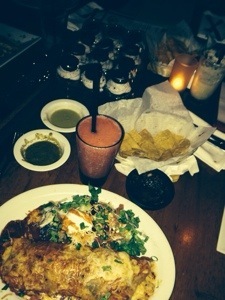 Until last night, Casa Vega in Sherman Oaks was my go-to Mexican restaurant. Their food is AMAZING! And their margaritas are in a class all their own. My mouth is watering just thinking about it. But Baja Cantina is a strong contender. Their food is good, Casa Vega still has one up on Baja Cantina in regards to the food. The margaritas however….Casa Vega better watch their back! I dined on their Rosemary Chicken Burrito. It was very delicious. Their Rosemary Chicken is slated to be World renown on their menu. I have to give it to them, it was pretty tasty. The portion wasn’t a disappointment. There was enough for two people to share from the same plate. I was definitely stuffed afterwards. 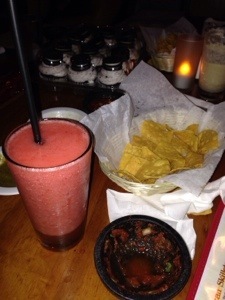 Also, the chips and salsa….let’s just talk about the chips and salsa….the best I’ve EVER HAD! That could have been my main dish. The salsa was just right. It wasn’t too mild and it wasn’t to spicy. It was soooooo good! And the tomatillo sauce was equally as delish! I went to Baja Cantina last night for a birthday celebration. We were in great company and had a really good time. The service was kind of slow, but overall I wouldn’t let that overshadow the entire experience. The decor of the place is gorgeous. It really gives you a feel of authentic Mexicana as soon as you walk in the door. It’s comforting and a great place to go and have drinks after work or watch a game. They have a patio with lights dangling overhead and plenty of seating. They also have valet for only $4! I would say that’s the best part, but the even better part is the fact that the restaurant is literally on the beach. It was night-time, so I couldn’t enjoy the full atmosphere, but I’m sure during the day it’s stunning! 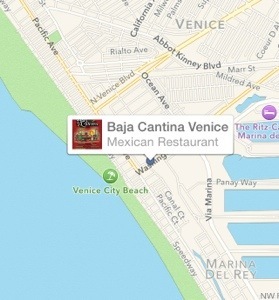 So, if you’re ever in the Venice/Marina del Rey area and you’re a fan of Mexican food, check this place out. You will not be disappointed!